Yamaguchi city is located in the westernmost prefecture of the main island of Japan. This area has gorgeous beaches, historical sites, and wonderful nature. In nearby Iwakuni city, you can visit Iwakuni Castle. The castle is on top of a mountain and most easily accessible by ropeway. From the castle, you can get a great bird’s-eye view of the city and the unique Kintai Bridge. A short drive or bus ride from Yamaguchi city is Akiyoshidai. These rolling fields are picturesque and a great place to explore nature and relax. 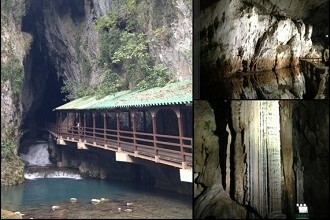 Akiyoshi Limestone Cave is located in Akiyoshidai and is the largest and longest limestone cave in Japan. You can see underground waterfalls and beautiful blue water flowing along the walking path. I love when my students achieve their goals. It’s also great when I’m able to teach them not only what they need to know but things they want to know as well. Through these kinds of experiences I’ve really bonded with my students. Please describe a typical work day. I sign-in to start the day, then I do a quick class room check to make sure things are in order, after that I check the big schedule to make sure I’m prepared for the day. I’m usually in the lobby five to ten minutes before my lessons so I can greet my students. Between classes sometimes I have mini-tests (check tests) with my students. I have an hour break for lunch. After I usually have more classes. If I have down time I’m prepping for other classes or helping out the other teachers. Before I go home, I double check the classrooms and the big schedule for the next day then sign out and head home.